주식회사 엘케이베이크웨어는 2005년 설립된 이래 베이커리 형틀 및 소도구를 공급하고 있는 업체로서 한국 베이커리 업계의 대표적인 업체로 성장해 왔습니다. 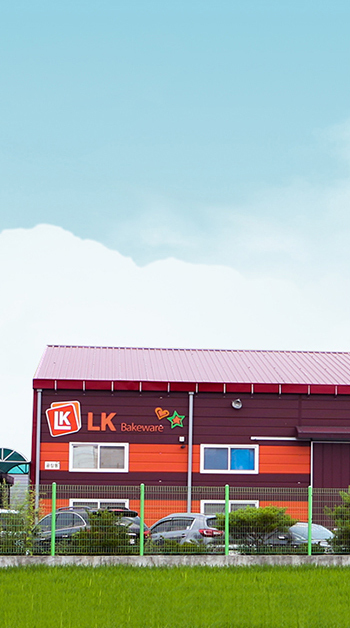 LK Bakeware Co., Ltd. has grown up as a leading company in the field of bakery industy in Korea since it was established as a supplier of bakery molds and utensils in 2005. 끊임없는 연구개발 활동을 통하여 독특한 디자인의 제품을 다양하게 공급함으로써 고객들에게 도움을 받아왔습니다. Through the endless R&D activities, we have helped our customers by supplying various products of unique design. 이에 엘케이베이크웨어는 국내에서의 경험을 기반으로 글로벌 대표업체로 성장하기 위해 더욱더 노력할 것이며 특히 고객에게 만족과 감동을 줄 수 있도록 전 직원이 혼연일체가 되어 기술 개발에 박차를 가할 것입니다. Now, LK Bakeware will make more efforts to be a global leading company based on the experiences and know-how accumulated in Korean domestic market and accelerate the technology development to give affection and satisfaction to our customers by all LK Bakeware members being united together. 엘케이베이크웨어는 항상 고객에게 정직으로 다가서는 기업이 될 수 있도록 노력할 것이며 여러분과 함께 더 좋은 미래로 나아가는 파트너가 될 수 있도록 진심을 다해 노력하겠습니다. We, LK Bakeware will do our best to become a company always approaching to customes with honesty, and we will also make every efforts to be a partner going together with you for a better future. COPYRIGHT ⓒ 2017 LK BAKEWARE. All rights reserved.